During the 1870s, when his Impressionist paintings sold poorly, Renoir supported himself with portrait commissions. This portrait of six-year-old Adelphine Legrand, the daughter of a friend and art dealer, shows the artist’s skill in capturing the hesitant personality of a young child, full of natural vivacity but determined to behave. 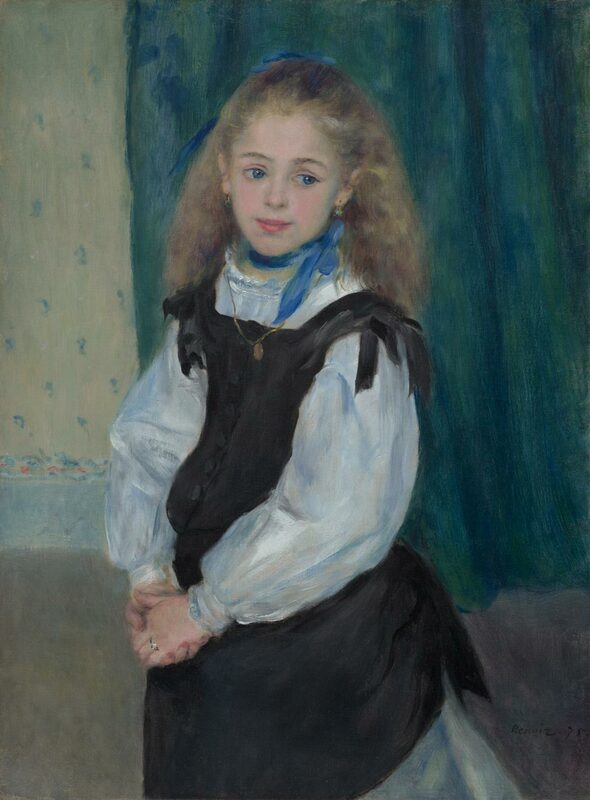 Renoir's charming portrait of eight-year-old Adelphine Legrand was painted early in his career, when he depended on portrait commissions to support himself and to build his reputation. With clasped hands and a hesitant expression, the young girl stands before the painter, on her best behavior but looking beyond him for reassurance and encouragement from someone else. Set in a sparsely decorated room, Adelphine's portrait is uncluttered with details, yet is dominated by the strong rich colors and wet brushstrokes of her black pinafore, the blue scarf knotted at her neck, and the green curtain behind her. A sense of spontaneity is captured by her gold locket, which hangs unevenly from her neck, as if it has just been pulled from under her pinafore. Adelphine's parents were members of the petite bourgeoisie: her father was a shop-clerk and her mother a maker of straw hats. Little is known about the circumstances of the commission or the relationship between Renoir and the Legrand family, though it seems the girl's parents knew the artists Frédéric Bazille and Jean-Baptiste Carpeaux. Renoir attended Adelphine's wedding in 1893, which suggests that he remained a close family friend. Jennifer A. Thompson, from Masterpieces from the Philadelphia Museum of Art: Impressionism and Modern Art (2007), p. 80. Alphonse Legrand, Paris, until 1910; Bernheim-Jeune, Paris, by 1911 ; half-share purchased by Durand-Ruel (with Paul Rosenberg?) 1 December 1933; purchased by Henry P. McIlhenny (1910-1986) on 28 November 1934, for $35,000; bequest to PMA, 1986. 1. See Guy-Patrice Dauberville and Michel Dauberville, Renoir: catalogue raisonné des tableaux, pastels, dessins et aquarelles, vol. 1, 1858-1881 (Paris, 2007), p. 491-492, no. 495. While in the Bernheim-Jeune home at l'avenue Henri-Martin, the portrait hung to the right of the entrance to the dining room; see Jean Dauberville, En Encadrant le siècle, Paris, 1967, illus. facing p. 573.